David Friesema is making me comfortable in bed. He raises the base to a sitting position—“Is this the right height? Sure you don’t want me to raise the legs?”—and fusses with the pillows. Once I’m settled, I ask him to join me; there’s plenty of room on this queen-size Serta iComfort TempActiv mattress with a “lifestyle base,” the preferred term for an adjustable bed. But he demurs (unseemly optics) and instead perches on the edge of the neighbouring mattress. This Sleep Country Canada store in suburban Toronto, which recently received a decor overhaul, is deserted, except for a couple of staffers tapping on keyboards behind a desk. Soft music wafts from speakers, and pillows lining the fullheight windows filter out the bright morning sun. A cloud-shaped plastic light cover suspended over my head informs me enigmatically that “koalas need 22 hours of sleep.” I only got about six, so it’s tempting to lower the base back down, corral one of the wayward pillows and... But no. Friesema has a busy day ahead. The CEO of Canada’s largest mattress chain radiates pent-up energy. A lifelong mattress peddler who started as a delivery man in his teens, he has the keen-to-please air of a salesman, one who gains your trust through sheer aw-shucks likeability. 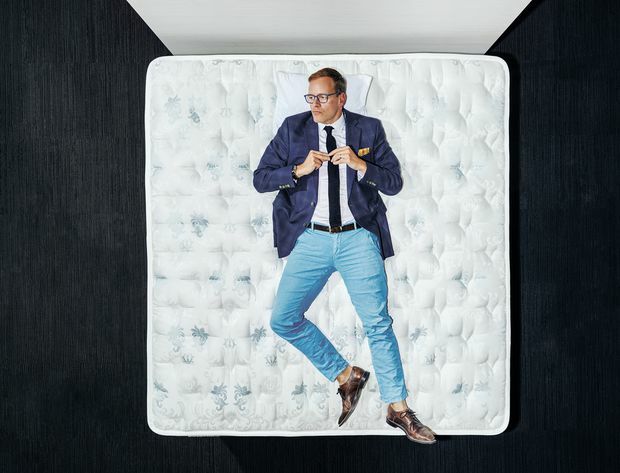 Dressed head to toe in blue—suit, shirt, eyeglass frames—he smiles eagerly, ready to field the question he knows is coming: How is Sleep Country Canada Holdings fending off online competitors flooding the market with shrink-wrapped foam? The answer, in short, is: deftly. The lack of customers here this morning belies the fact that business is thriving. Sleep Country’s same-store sales have been averaging 8.8% quarterly growth for almost five years, despite the mattress industry itself expanding at a snoozy 1% or so a year. The chain sells more mattresses in this country than anyone else –its market share is about 27% and growing, thanks in part to the recent demise of its biggest competitor, Sears Canada (Leon’s and the Brick have another 16% to 20% combined). Sleep Country is adding an average of 10 to 12 stores a year, yet is nowhere near saturation point. These days, purveyors of myriad mundane consumer products, from bottled water to razors, are trying to forge relationships with customers based on humanitarian goals or high-tech wizardry or online communities. Casper, Purple, Endy and dozens of other cutely named e-tailers have been applying the same tactics to the utilitarian mattress, turning it into the latest digital-makeover star, while stealing sales away from bricks-and-mortar retailers. To most people, shopping for a mattress is an ordeal similar to buying a used car. The industry is notorious for high-pressure sales tactics and claims of huge “discounts” on sometimes arbitrary suggested retail prices—a strategy the Competition Bureau has accused both Hudson’s Bay and Sears Canada of practising. Then there is the confusing nomenclature: Because large retailers strike exclusive deals with manufacturers, like Serta or Tempur Sealy, virtually identical products will have different names at competing chains, helping to foil price comparisons. Throw in obscure jargon and dubious science claims, and befuddled shoppers are left feeling conned. But the lack of transparency that confounds consumers helps make mattress retail an enticing business. While mattresses account for about 20% of the typical Canadian furniture retailer's sales, they are believed to produce the highest and most sustainable gross margins, according to Home Goods Online. A widely cited Consumer Reports study pegs those margins at a cushy 30% to 50%, among the best in retail. According to Knell, the margins on fridges, for example, are just 12% to 15%. Sleep Country reports gross margins of almost 30%. A mattress store is also cheap to run, with an “asset-light business model,” as Friesema puts it. Salespeople are usually paid on commission, and stores are essentially showrooms, with the customer's selection shipped from the manufacturer to the retailer's distribution centre to the home. (The vast majority of mattresses are manufactured domestically, due to the high cost of shipping the bulky items overseas.) That leaves retailers with negative working capital, meaning they can have fewer assets on hand than they have liabilities. Manufacturers also kick in significant advertising dollars and rebates, both of which rise with sales volume. In the early 1990s, these attractive economics drew the attention of Stephen Gunn and Gordon Lownds, partners in boutique investment firm Kenrick Capital, who had led a buyout of mattress manufacturer Simmons Canada. They approached Christine Magee, a corporate and commercial lending executive at National Bank with whom they’d worked in the past. “We saw some interesting fundamentals: a recurring source of demand, a growing population, aging baby boomers and a growing focus on the importance of sleep,” Magee recalls. “It’s also one of the few retail categories where you don’t have to tie up much cash in inventory.” The trio figured that by improving service, both in-store and at delivery, they could steal market share away from department stores, furniture chains and small independents. They launched Sleep Country in Vancouver in 1994, striking a licensing and marketing agreement with a pre-existing U.S. chain of the same name. Within the first year, the company opened 12 stores. By 1996, Sleep Country had moved into Ontario with 19 more stores. “We grew our business very regionally,” says Friesema, who joined the Canadian operation in 1995 to head up sales. “We wouldn’t add a new region until we were very comfortable in the existing one.” That meant having a store within easy reach of anyone who heard or saw the company’s ads. Sleep Country established a strong presence in each region in part to create a competitive barrier to imitators—of which there were soon many, including the Brick Mattress stores and Dormezvous? Sleep Centres in Montreal. “I took Polaroids of Sleep Country stores and kept copying what they were doing,” admits Stewart Schaefer, a former commodities broker who founded Dormez-vous the same year Sleep Country launched. When the larger chain approached him about a merger, Schaefer gladly agreed and now serves as the company's chief business development officer. Part of Sleep Country’s formula was to never cut back on advertising. It broke that rule after the financial crisis. “We reduced marketing too long,” says Friesema, “and it hurt our business.” Another misstep was the 2006 acquisition of a chain in Arizona. “We bought at the top of the market, right before the housing crash,” says Schaefer. The customer acquisition cost turned out to be the same in the U.S. as in Canada, but sales and market share grew much faster on Sleep Country’s home turf, and the competition was less intense. In preparation for its 2015 IPO, Sleep Country sold the U.S. arm—for half of what it had paid nine years earlier. Sleep Country's founders chose this time to hand management to Friesema and Schaefer. Friesema delivered mattresses in the Detroit area in high school and sold them during university. After graduation, he went to work for two leading U.S. chains, including Sleep Country USA. He left briefly for the liquid petroleum industry, of all things, but Sleep Country Canada pulled him back in. In a way, he’s still a mattress salesman—just targeting investors instead of consumers. Christine Magee has been the face of the brand since the start. Sleep is a hot topic these days. The machismo of past decades that “glorified sleeplessness in the way we once glorified people who could hold their liquor,” in the words of Harvard sleep-medicine specialist Charles Czeisler, has given way to the recognition that solid shut-eye is essential to good health. Studies suggest that two-thirds or more of the population isn’t getting enough sleep and roughly one in 10 Canadians suffers from insomnia. Science largely blames the modern lifestyle: stress, late-night stimulation by electronics, a corporate culture that rewards long hours. An ill-suited mattress? Not so much—but that hasn’t stopped the industry from capitalizing on the attention. For a long time, Friesema says, mattresses were very similar. “When I started in this industry, the basic premise was the harder, the better." One of Sleep Country’s strategies was to stress that firmness was a personal choice. The emergence of new materials, from the all-foam TempurPedic to gels purporting to control temperature, expanded consumer choice (and confusion), boosting the perceived need for a retailer to act as a knowledgeable guide. These improvements come at extra cost. Consumers are also increasingly buying larger beds (queen is now the most popular size; a generation ago, it was double) and choosing pillow-top and high-end foam options. Growing home sales have generally meant more bedrooms to equip. The rising popularity of lifestyle bases (a name coined to avoid associations with the infirm) that adjust for watching TV or typing, as well as customizable, organic and eco-friendly mattresses, have steadily increased the average amount a mattress customer spends. Still, it’s believed mattress unit sales aren’t keeping up with population growth, says Friesema. “Maybe we’ve lost a little share of the consumer wallet.” Mattresses are typically replaced once a decade—and are likely among the first purchases deferred if money is tight. With the industry stagnant, growth largely means stealing business from others. To help Sleep Country do that, Friesema initiated the development of a painstaking training program for salespeople, which analysts have called one of its key competitive advantages. New recruits spend two months in a classroom, shadowing salespeople and visiting manufacturers, and then a minimum of one day per quarter in further training. Friesema admits to being a bit rusty, but he's game to show me the art of the mattress sale. It starts with a detailed qualifying process: What size of mattress are you looking for? Is it for yourself or a guest room? How old is your current mattress? What don't you like about it? After a while, the questions become more personal: How well do you sleep? How hot do you sleep? Do you have back or shoulder aches? One of the weird things about buying a mattress is its intimacy. Sleeping is a private act, but you're asked to describe it and simulate it in public. That’s where the “comfort test” comes in. Friesema points me to two queen mattresses, similar but for an extra inch of pillow-top on one of them. He asks me to lie down on one and then the other. “Take a few minutes—don’t feel rushed,” he says. It’s recommended that shoppers spend 15 minutes on a bed before making a decision, but that seems like an eternity when someone’s watching you. Only once you know what you like does cost enter the discussion. Most stores carry five or six mattresses of similar comfort level, but one might be $2,000 and another $500. The method has a high success rate: Sleep Country converts about 60% of its shoppers to buyers. The average customer spends 25 minutes instore, but some people roll around on mattresses for up to four hours. When I express amazement at this figure, Galen Midwinter, the regional sales manager who’s been keeping a discreet distance while Friesema leads me around, observes, ''You don’t buy things that are tailor-made without being measured." The biggest growth recently has been at the high end. The most finely turned “sleep system” Sleep Country carries is the Palais Royale, he informs me. A king-size retails for about $7,200. Midwinter laughs. “There are no elves holding you up with fairy dust,” he says, but you get the best of everything else: support for your hips and shoulders, durability, and temperature control, all covered in pure wool. This high-touch service—which extends to delivery workers, who don slippers upon entering your home and clean up after the drop-off—helps Sleep Country with its “second-bedroom strategy:” leaving the customer wanting to buy more, and more often than once a decade. 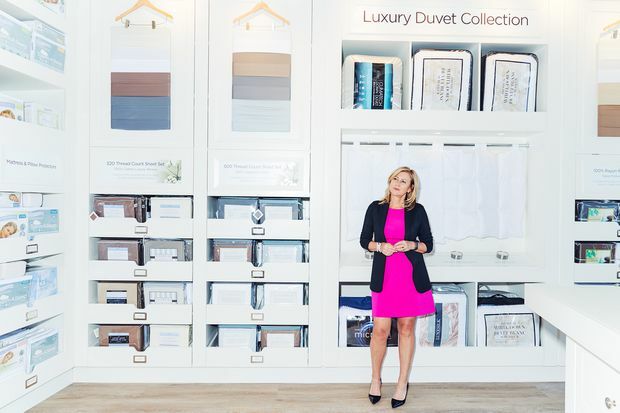 To spur this impulse, it’s renovating all of its stores to feature an accessories area displaying sheets, duvets and pillows. (The impetus for this came during a Retail Council of Canada meeting, when an executive from the Bay told Schaefer the store would build up its bedding inventory during Sleep Country’s annual mix-and-match sale to capitalize on demand from new mattress owners.) The area is cozy and highly tactile, just begging you to fondle the fabrics and squeeze the pillows. The accessories not only increase the size of the so-called shopping basket but also offer margins that are 10 points higher than those on mattresses. They now account for 20% of sales—almost three times as much as in a typical mattress store. All these moves have enabled Sleep Country to notch 19 quarters of rising same-store sales. Martin Landry, managing director of equity research at GMP Securities, calls Sleep Country “a very sophisticated retailer,” crediting Friesema’s team with “flawless execution on a lot of fronts." But the biggest test of the chain’s strategy is just beginning: the bed-in-a-box trend. “Some investors are concerned that online retailing could slow down Sleep Country’s growth,” says Landry. One of the innovations online retailers have ushered in is to eliminate the confusion of choice. Mike Gettis, who started Toronto-based Endy, argues that one well-made foam mattress can fit anyone’s needs. A self-described “nerdy engineer” who rarely got a good night’s sleep, he designed the Endy mattress in-house. “We have stripped down the mattress [price], and aren’t adding extra frills and features,” he says. At $850 for a queen, Endy’s made-in-Canada offering may not seem like a bargain—you can buy an Ikea foam mattress for $199—but quality and price vary depending on the number of foam layers and other factors. Big Mattress isn’t taking all this lying down. Several large players have launched their own bed-in-a-box brands. Sleep Country introduced Bloom in May 2017; its cheapest model starts at $395. The company doesn’t break out sales, but Schaefer says the Bloom line, which is made in China, is one of its top five sellers and brings in younger, hipper consumers. Paradoxically, Sleep Country views its stores as its edge in the digital battle. Friesema says that more than 85% of all Bloom transactions happen in-store. Casper recently partnered with Hudson’s Bay and others to offer products in Canada (it’s also opened a few of its own stores), and Endy mattresses are featured in boutique furniture stores. “It’s an endorsement that ‘online only’ doesn’t work,” says Landry. While e-commerce in Canada is estimated at less than 10% of total mattress sales, growth has been rapid. Just look at Endy: Within two years, it had sold 25,000 mattresses, and revenue had grown by 3,000%. Now it’s up to 50,000-plus mattresses and is projecting 2018 sales of $50 million. Landry argues the difficulty in comparisonshopping for mattresses online will help insulate Sleep Country from the showrooming trend. Its prices are comparable, if not lower, than online players, and there are perks: Delivery people dispose of your old mattress and set up the new one. Casper just leaves the box on your doorstep. Landry also points out the online players haven’t yet seen many warranty returns (10 years is typical in the industry). “What happens when you get into year six or seven and customers start to return their mattresses?” The arrival of online retailers has actually helped Sleep Country in one important way: by putting mattresses at the top of consumers' minds. Endy and Casper ads have wallpapered entire subway cars in Toronto and are prolific online. “The mattress industry is a sleepy industry,” says Schaefer. “So we love it when other people advertise. It makes consumers say, ‘Honey, we haven’t changed the mattress in a long time. '” This is particularly useful now that a leading advertiser is gone. Analysts expect Sleep Country to pick up about half of Sears’s mattress market share, estimated at about 10% at the time of its demise. The company boosted its 2018 advertising budget by double digits in part to capitalize on Sears’s absence and is expected to venture into smaller towns where Sears had a strong presence. The chain is planning to open at least 15 stores this year. Landry believes it has lots of room to grow: Sleep Country now has one store per 140,000 people in Canada and could expand to one per 100,000. That implies 350 stores, which, at the current rate, will take seven to 10 years. The cooling housing market has some investors concerned, but Friesema says real estate isn't as big a factor in mattress sales as many believe. A more recent worry is Canada's introduction of new tariffs on mattresses from the U.S.--the source of about a third of this country's mattress and bedding imports--as part of an intensifying trade war with our southern neighbour. The Retail Council of Canada warns this will likely lead to higher prices.